Throughout the lifetime of the ICRI, the guiding principles were: design for humans; build for the long term and the imperfections of the real world; and be able to deliver social, economic and environmental value. As part of this large-scale research agenda, we created a Living Lab at London's Queen Elizabeth Olympic Park (QEOP) - itself undergoing regeneration since the end of the Olympic Games, held there in 2012. A number of prototypes and sensing infrastructure were deployed in the park, helping to transform it into a 'smart' park, delivering services and experiences to local communities and businesses. For example, one project investigated how to leverage the latest advances in IoT and edge computing in order to design and develop smart sensors that could monitor bat activity in real-time across a large diverse urban environment. 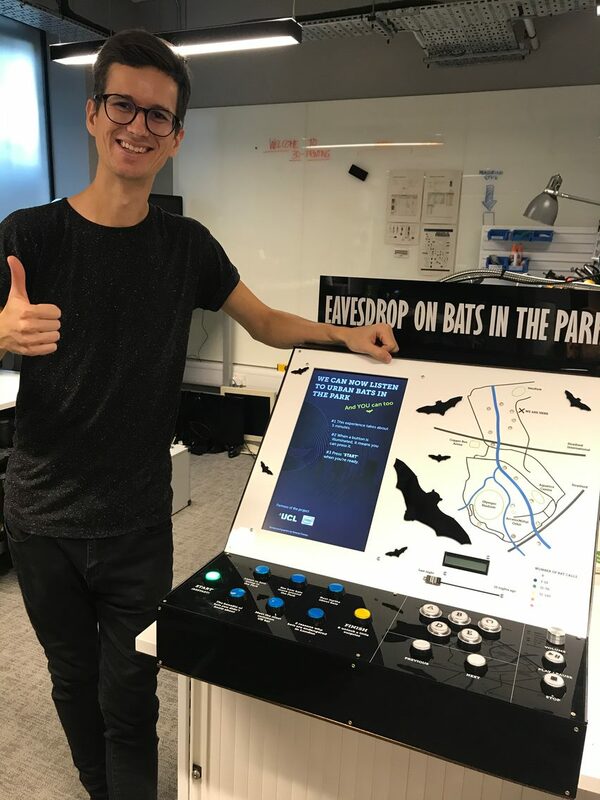 As part of this project, PlayBat was developed by one of our 2017 HCI Master's students Matej Kaninsky, where he built a physical public display, that combined a novel multi-modal interface, an interactive narrative structure together with the real-time IoT environmentally sensed bat call data. The aim was to evoke curiosity, discovery and challenge the oft-held negative perception about bats. When placed in the QEOP park, PlayBat was found to draw all manner of people to explore the live bat data, and at the end, even change their minds to like bats more. Another project called Roam-io, explored how to sense and make visible to the general public, data about how urban spaces are being used by people. Quantitative data was collected, using an urban IoT sensing infrastructure along with qualitative data, asking people to answer relevant questions in public, by using a walk-up, robot-like installation. The ensuing hybrid dataset helped us to build a better understanding of what happens in urban spaces, where it can be difficult to interpret the data streams arising from environmental sensors, by themselves. During the five years of the ICRI, UCL hired 14 post docs, 6 PhD students, and various interns and visitors, who worked on an amazing array of projects. All the researchers have now moved onto new careers and pastures new. There is a legacy website comprising papers, project descriptions, a portrait gallery of 'who's who', videos capturing many of the projects and PhD students explaining their work and much more about what happened on our adventurous 5-year journey.